The 401st furnished the three Squadrons making up the 94th Combat Wing “A” formation. The Lead and Low Squadrons bombed visually and the High Squadron by PFF, all with good results. 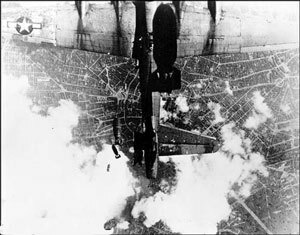 This day it was the turn of the B-17’s to face the attack of mass formations of Luftwaffe F-190 fighters. 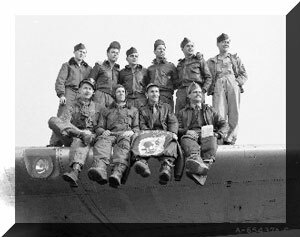 In one pass, 18 B-17’s were shot down, 11 of them aircraft of the 303rd Bomb Group at Molesworth. Fortunately, the 401st did not encounter Luftwaffe fighters but met intense flak over the target. As a result, “Little Moe” (No. 42-31069), piloted by Lt. E. H. Daves, went down when its No. 2 engine was hit and burst into flames. All crew members were able to parachute safely and were captured upon landing. Another 401st ship, “Miss B Havin” (No. 42-31863), piloted by Lt. Charles W. Utter, also had one engine knocked out and another operating at less than full power. Steadily losing altitude, Lt. Utter decided to land on a 1,500 foot fighter strip near Ghent, Belgium. 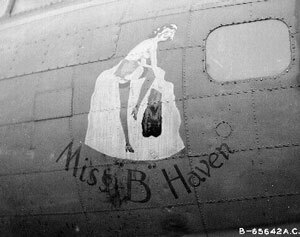 He set the crippled B-17 down safely, coming to a stop six feet from a deep drainage ditch, and two days later the crew was flown back to Deenthrope in C-47’s. This Jacket hangs in the closet today. Custom hand made by FlightJackets.com. It was painstakingly recreated over a 4 month process. With no detail left undone. This is one of the finest jackets you can buy. After 10 years of wear, water, snow, it’s just now starting to “break-in”. Other Details: Force-landed in Belgium. Scrapped.